Guten Morgen Grammar: Hot Dative | Guten Morgen Berlin! June 6, 2015 June 9, 2015 - Guten Morgen Berlin! Alright guys. Before we do anything else, let’s go over some terminology. Some of you will already know these terms, but I’m not going to start talking about how to make a cake until I’m sure that everyone here knows what a bowl and a whisk are. There are two main elements in any one sentence or clause besides the verb: the subject and the object. The subject is the thing which carries out the action of the verb – the ‘main character’ of the sentence, you might say – while the object is the thing which has the action done to it – perhaps the ‘best supporting role’? For example, if I catch a bee in my hand, I am the subject and the bee is the object; it is the thing being caught. If the bee then stings me, the bee is the subject and I am the regretful object. If my cat catches a bee in its mouth, though, the cat is the subject and the bee becomes both the object and a delicious crunchy snack. To show the difference between the subject and the object, they each have their own ‘case’, which is a special way of showing their grammatical role in the sentence by using different words and structures with each thing. The subject is always in the nominative case, and the object is always in the accusative case; we have this to a very small extent in English, for example when the bee stings me and not I – ‘me’ is the accusative form of ‘I’. In German, this case distinction is shown in all the articles (der, die, das, ein, eine, etc), adjectives (see prev article) and much more besides. Click the link to see how all the articles change depending on gender and case. 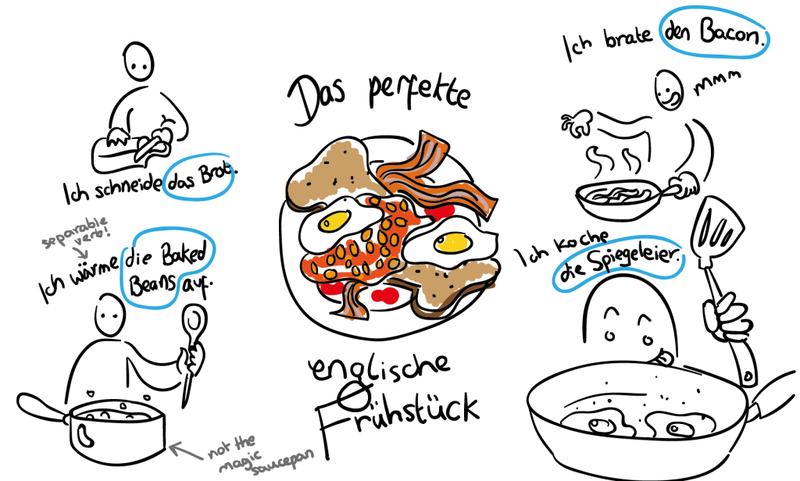 Let’s watch this guy make a delicious English breakfast (and boy, do the Germans love a good English breakfast. ‘You eat a whole plate of fried crap for breakfast? Geil!!’). The nouns circled in blue are in the accusative, because they are the things which are having all the cooking actions done to them by ‘ich’, the subject. You can see how the accusative changes the definite article for the masculine noun ‘Bacon’ because the masculine nouns are the only ones whose articles, adjective endings etc change in the accusative. It’s pretty simple, and we’ll do more on that in another lesson. He said some really mean things to me! ‘He’ is the subject, doing the saying; ‘really mean things’ is the accusative object (also known as the direct object); ‘me’ is the dative object (also known as the indirect object), because it is the target of this ‘to’. The ‘to’, and the dative, is a structure which allows us to describe a verb affecting two different nouns at the same time: one noun is directly affected (i.e. a present is given) while another noun is indirectly affected (i.e. I receive the present; it is given to me). For example, here the dad ‘He’ is the subject, the ‘dad joke’ is the thing being told, and ‘me’ is the dative object receiving the joke. Somewhat unwillingly. Here’s another example. Please note that it is an example and I do not accept any responsibility for anyone who decides to eat a dead bee, nor will I pay ten dollars for that action. Let’s look at how this works in German. She gave me the wrong book. ‘Me’ is in the dative here, because it’s the object in the receiving position. Click here to revise what the pronouns like ‘ich’ do in different cases. This is an example of how a sentence can contain a dative object but not an accusative object. ‘Erzählen’ and the other words which use the dative (see below) need a dative object every time, but here the accusative object has been replaced with ‘about your sins’, a prepositional phrase. You could always sub it out with an accusative object though, and say ‘Du musst dem Papst deine Sünden erzählen’ – you have to tell your sins to the Pope. Here are some of the main verbs which take a dative object in German. 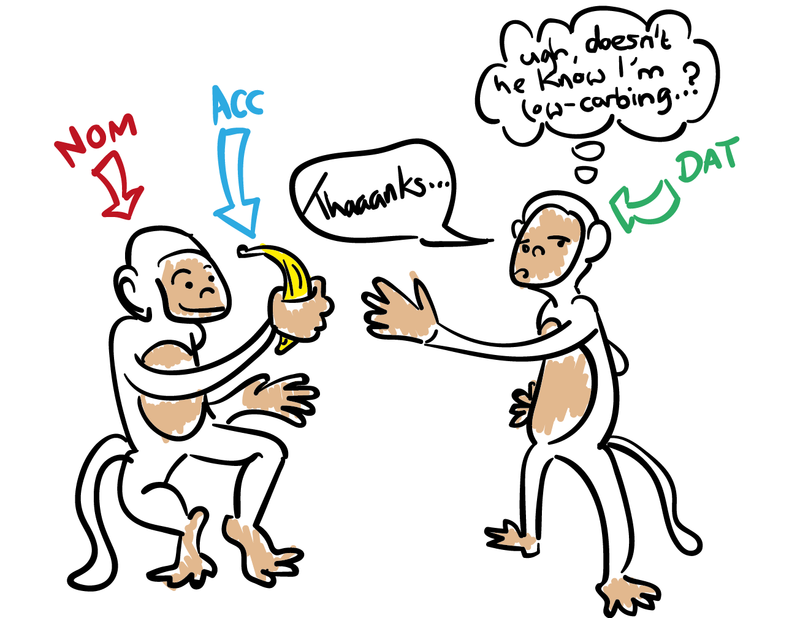 The best way to remind yourself what kind of object a verb takes is to add ‘jdn’ or ‘jdm’ to each verb. This is shorthand for ‘jemanden’ (‘someone’ in the accusative) or ‘jemandem’ (‘someone’ in the dative) – and you can also use ‘etw’ as shorthand for ‘something’ in the accusative, for the verbs which take both. A lot of people get confused and think that all verbs which imply a communicative or ‘giving’ sense take a dative, so they mistakenly use the dative with verbs like ‘fragen’, ‘bekommen’, ‘informieren’ and so on. A good trick to figure out whether or not a verb should take the dative in German is to think about how it would sound in old-timey English: ‘I say unto you…’, ‘Disclose unto me…’, ‘Pray explain to me…’ all sound like excellent beginnings to lines in Game of Thrones, whereas ‘I ask unto you’ doesn’t work. Fragen takes the accusative. Boom. jdm helfen – Er hat mir geholfen, meine Grammatikübungen zu lernen. jdm gratulieren – Wir gratulieren dir zu deinem Geburtstag! jdm danken – Ich danke dir ganz herzlich! jdm etw empfehlen – Suri empfiehlt uns das Restaurant am Potsdamer Platz. Keep these in mind, because we’ll be going into those and other uses of the dative in future lessons. Here are some examples of German sentences you’ll end up using *all the time* with the dative in – translate and try to learn these sentences. You can swap in different vocab depending on what you want to say to make it really easy to start integrating dative constructions into your spoken German without even having to think too hard about it! 1. Kannst du mir bitte die Butter geben? 2. Ich habe ihm aber nie gesagt, dass ich zustimme. 3. Erzähl deinem Bruder die Geschichte von deiner Geburtstagsparty! 4. Wir helfen den Kindern, ihre Laternen zu basteln. 5. Zeigen Sie mir bitte wie der Toaster funktioniert. 6. Wir schicken unseren Kunden einen monatlichen Newsletter. 7. Ich muss Ihnen leider mitteilen, dass ihr Termin ausfällt. ← Men’s day. And one woman’s news. I love your style and I find the content really useful. Brilliant work! !